I entered China with a 5-day visa ("Shenzhen Special Economic Zone Tourism Visa") when entering Shenzhen by train from Hong Kong. The back of the departure card given by the Chinese immigration while entering China mentioned I don't have to do the police registration if I stay at a hotel. When staying in a hotel, the registration is usually done as a part of the check-in process. 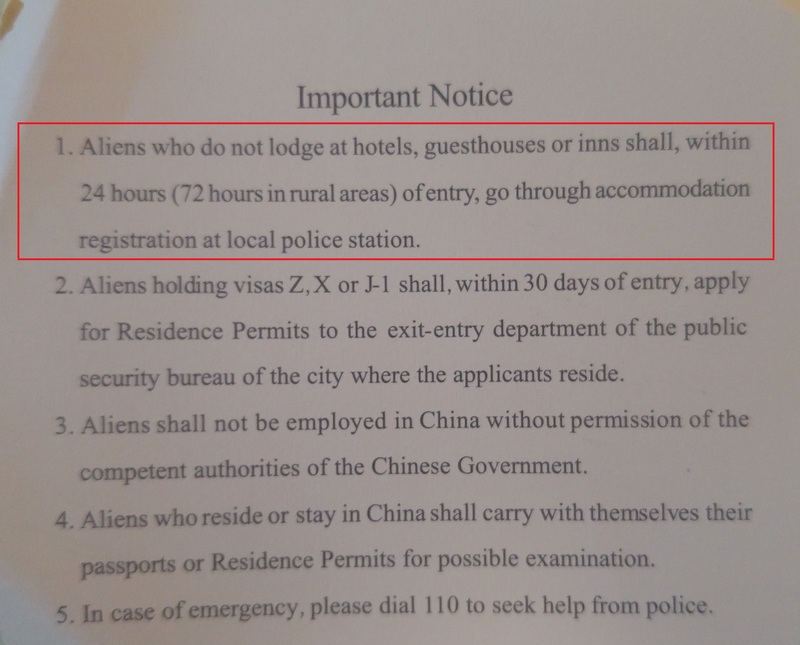 Do I have to register at the police station if the hotel I stay at doesn't do it for me after entering China with a Shenzhen Special Economic Zone Tourism Visa? Disclaimer: This answer is based on a layman reading of the text of Chinese law freely available on the internet. This is obviously not an legal advice. If you are staying in a hotel in China, the onus is on the hotel to get you registered and pass your information to the police. Article 10 Hotels should record guests' ID on the Administration of Public Security in Hospitality Industry Information System, and send the information to the police within 3 hours of the guest checking-in. Where such system are not built/implemented, hotels should present the registration form(s) to the police on the same day. Hotels should carefully retain the registrations for a year. According to Article 21, the penalty (for the hotel) is a RMB 1,000-5,000 fine, subject to probation. Not the answer you're looking for? Browse other questions tagged paperwork china registration shenzhen or ask your own question.